I’ve just recently got back after spending a fortnight holidaying in the Mediterranean on the island of Cyprus. 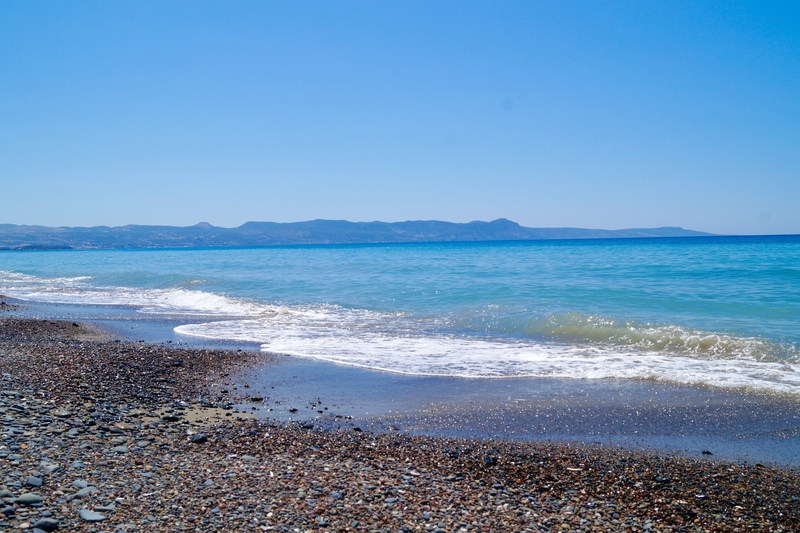 This wasn’t my first visit to this beautiful country, I’ve previously shared a blog post with pictures from our last visit two summers ago and before that I’d already visited Cyprus on two other occasions before starting this blog. Here I’ve put together a collection of my favourite snapshots from my time away. It was yet another fun and memorable trip to a destination that’s very close to my heart. Our journey to Cyprus started early (wakeup call was 1:45am), I only managed a few hours sleep before we headed to the airport and I think this was due to excitement! Once we boarded our flight, four and half hours later we landed in Cyprus to be welcomed with predicted sunny and warm weather. After collecting our suitcases and sorting out our car hire we departed the airport and drove to our villa. 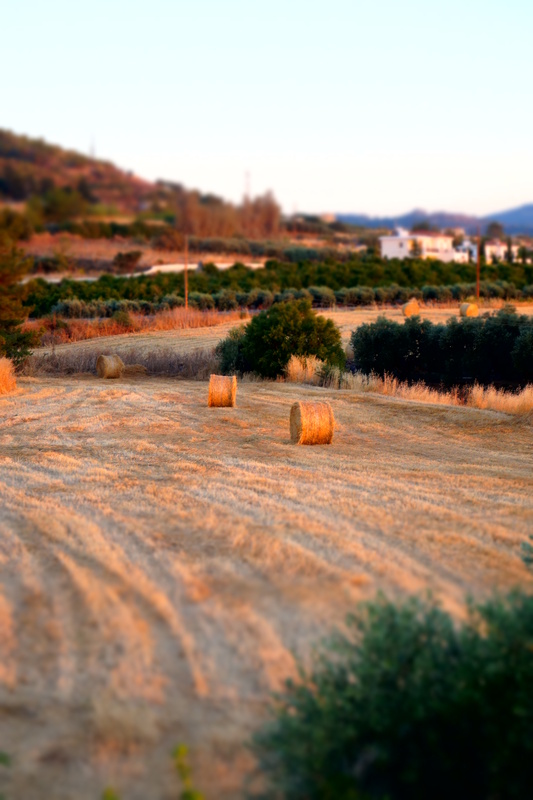 We stayed in Argaka, a small village located near the town of Polis. This is my third visit to Argaka, the village is barely touched by tourism and that’s what appeals most to me. It’s a great place to get an experience of Cypriot life. Before arriving at our villa we stopped off at Limni Pier where we ate lunch and took in some breathtaking views and the deep blue sea. Upon arrival at the villa we were totally blown away, we had our own private beach just outside the villa (the perks of not saying in a complex), a pool and even a tennis court – my sister and I both made good use of these to work off the ice cream we ate and the scrumptious galaktoboureko (Greek semolina custard pie with syrup) the villa owner, Savvas, brought round for us on the first night. The sweet pie was very delicious and successfully devoured in less than 24 hours! For a food lover like myself having a bakery right next door to us was fantastic, but as you can guess there was always temptation from all the delicious Cypriot and Greek treats like cakes, loukoumades (fried pastry balls soaked with honey), sweet and savoury pies such as tiropittes (flaky pastry cheese pies) and spanakopittes (cheese and spinach pies) – imagine a mini bitesize version of spanakopita. On this trip we travelled around a bit more and visited some of the attractions we didn’t get to see previously. Below I’ve added some snapshots of what we got up to and saw this time around! Agios Georgios is a village situated in the Paphos (Pafos) district of Cyprus. The church and stunning views are just a few reasons why this is one of the best places to stop off. 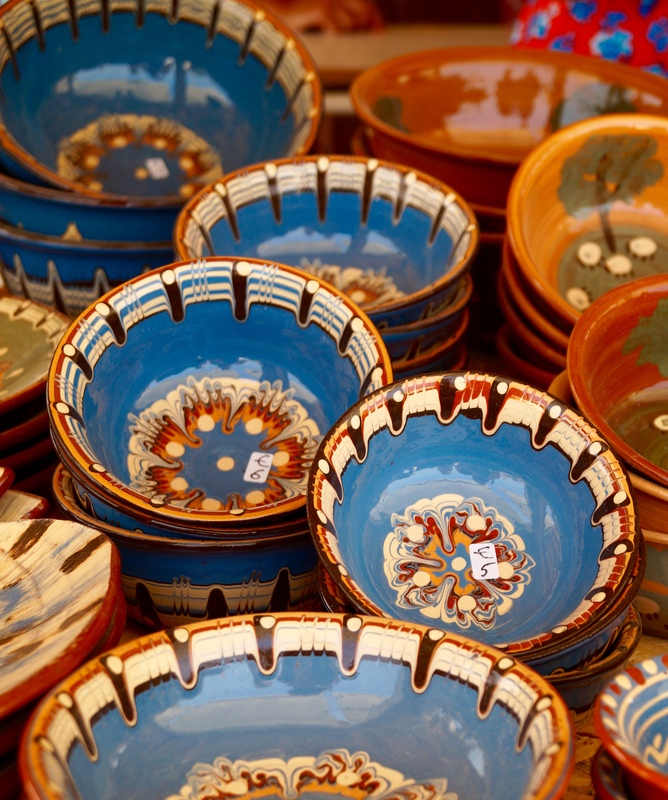 There’s also a pottery stall which sells lovely hand-painted bowls and plates among many other things. 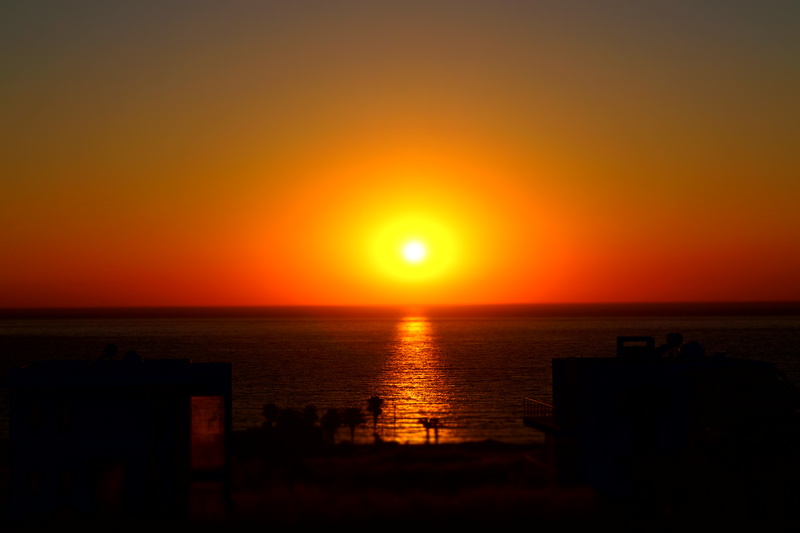 You might already know this, but Cyprus is known as the island of love. Aphrodite was the Greek goddess of love and Cyprus was her place of birth. Aphrodite’s Rock is also known as Petra tou Romiou (“Rock of the Roman”). 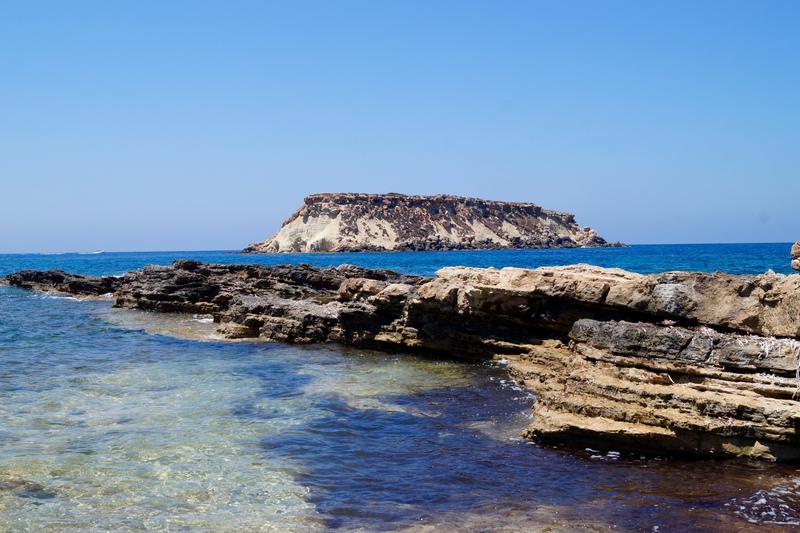 Located between Paphos and Limassol, it’s well worth a visit and popular with tourists visiting Cyprus. A swim around the rock is definitely something you might like to tick off your bucket list, but a warning, the water is very cold! 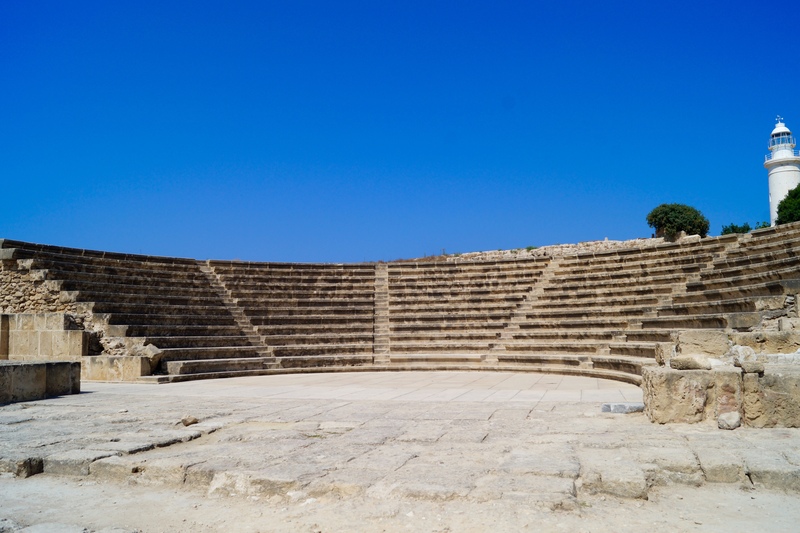 Kourion (Curium) is an archaeological site located on the west coast of Limassol in the town of Episkopi. Here you can see an expansive collection of mosaics and monuments that date back to the Roman period and the remains of the ancient city of Kourion. Just make sure you plan a visit here before the midday heat and sun arrive and come prepared for the walk around with a hat, lots of water and sun cream! 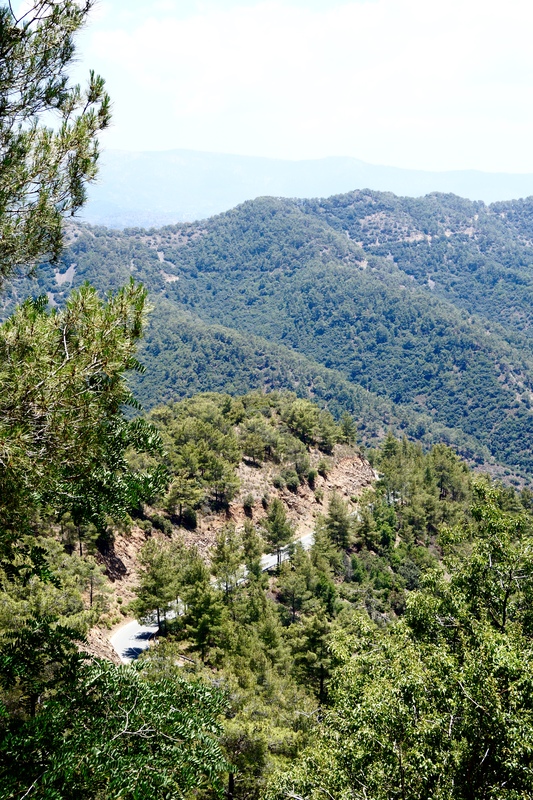 The Troodos mountains are the largest mountain range in Cyprus. As you drive through you can see lots of different wildlife like snakes slithering across the road and you can even visit a mouffalon enclosure. Mouffalon are wild sheep native to Cyprus and other Middle-Eastern countries. The first time we went we weren’t lucky and didn’t manage to spot any mouffalon, however this time luck was on our side and I captured this picture above! Next I’m moving onto one of the best parts of travelling to a different country, the food. Cypriot and Greek are two of my favourite cuisines. Both cuisines are similar, but they do have some differences. 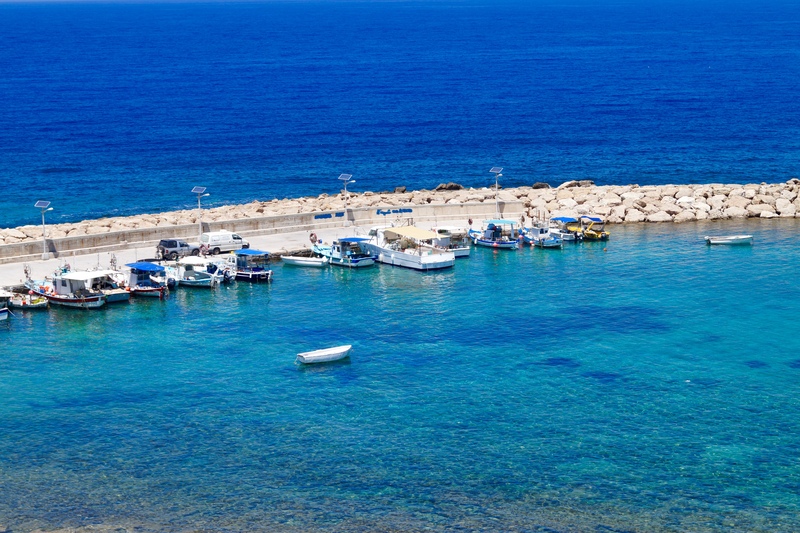 Cyprus is famous for halloumi, a cheese that’s made from either goat’s or ewe’s milk. It’s eaten raw or cooked in Cyprus, but I prefer it either grilled or fried and garnished with oregano and fresh lemon juice. Cyprus is also home to several yummy treats, kattimeri is a sweet crêpe-style pancake that’s traditionally filled with sugar or honey and cinnamon. We bought these almost daily when we visited the supermarket to stock up on groceries. The pancake is quite big so we’d cut it into quarters and topped with Greek yoghurt and fresh sliced peach – I don’t think that’s how Cypriots serve the pancake, but the flavours worked well together and we turned it into a great dessert. I love these pancakes so much that I even packed one to eat on the plane journey home! As we were self-catering we visited the supermarket to get ingredients every couple of days. We ate Greek salad every single day and it’s one of our favourite salads to eat all year round. Authentic Greek salad is simply made with refreshing cucumber, tangy red onion, juicy tomatoes, chopped bell pepper and olives can sometimes be included along with extra virgin Greek olive oil, salty feta cheese, oregano and finally, salt and pepper to season. Lunch most days consisted of a small mezze, a portion of Greek salad, pita bread or Lebanese flatbread and dips like hummus and tzatziki. We bought some tzatziki and unfortunately we were disappointed by the flavour, so I ended up making my own recipe instead. The country also has a great street food scene. At the roadside you can grab some buttery corn the cob, souvlaki (beef, chicken or pork kebabs marinated in olive oil and oregano) and also sheftalia, which is a Cypriot lamb and pork sausage. I already knew how well the Cypriots do sweet treats after my last visit and this time we enjoyed several delicious ice creams. 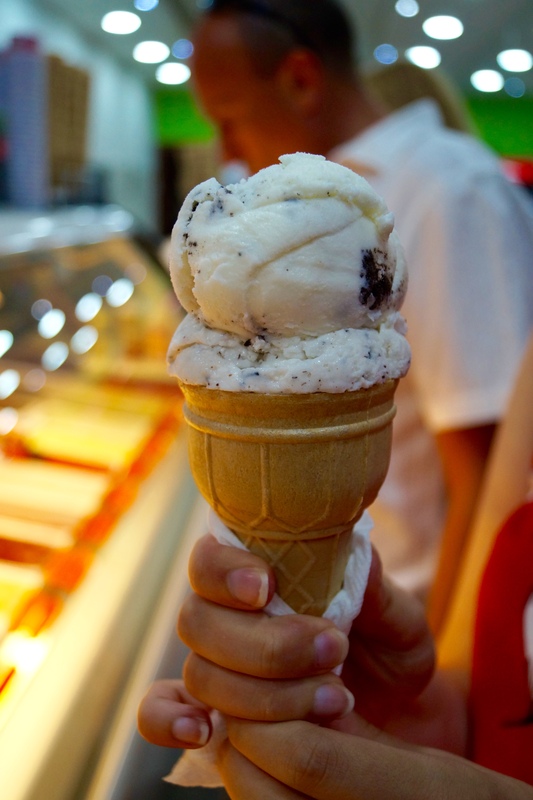 There was an endless choice of ice cream flavours available at the shop where we ordered ice cream each time we were visiting Paphos, the picture below shows a scoop of chocolate stracciatella and a scoop of cookies and cream. Ice cream definitely helped cool us down when Cyprus was experiencing a heatwave on the last few days of our holiday when temperatures soared beyond 40°C! Cyprus is also home to a sweet treat, loukoumi and this is more commonly known to the rest of the world as Turkish delight. We got some lemon flavoured loukoumi, which was made in Geroskipou. 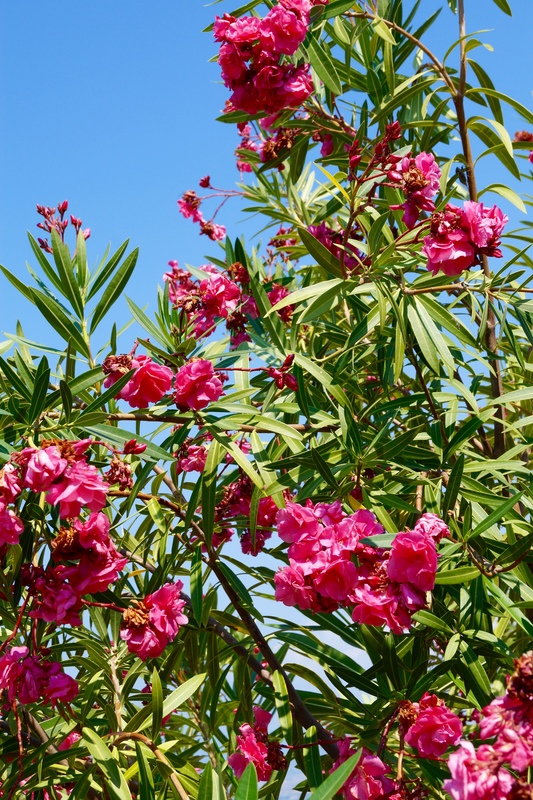 Geroskipou meaning “sacred garden” was the mythical sanctuary of Aphrodite, the goddess of love. The factory in Geroskipou is actually close to Aphrodite’s birthplace, Petra tou Romiou. I’ve personally never been a fan of Turkish delight, but I decided to be adventurous and give it a try. I don’t usually like anything that’s been flavoured with rosewater, so this lemon version was much more pleasant for me. Argaka on the western side of the island is the perfect place to take pictures of the sun setting. Experiencing the sunsets is something really special. I really hope you’ve enjoyed looking through my photographs from this years holiday. Sharing travel blog posts is something I’m really passionate about and I love doing just as much as sharing recipes. If you want more travel reads, take a look at this article I wrote about Ibiza! I’m sharing a non-food blog post today! I’m back after spending an amazing, relaxing fortnight in Ibiza. I’ve enjoyed a break from blogging to have some time off after passing my end of year cookery exams and starting a new job. Here is a collection of my favourite photos from our time away. We love nothing more than getting away from the tourist trail and heading further afield to discover the hidden gems – that’s always the best way to set about travelling! My mind keeps drifting back to the stunning island and I cannot wait to plan my next visit sometime soon. 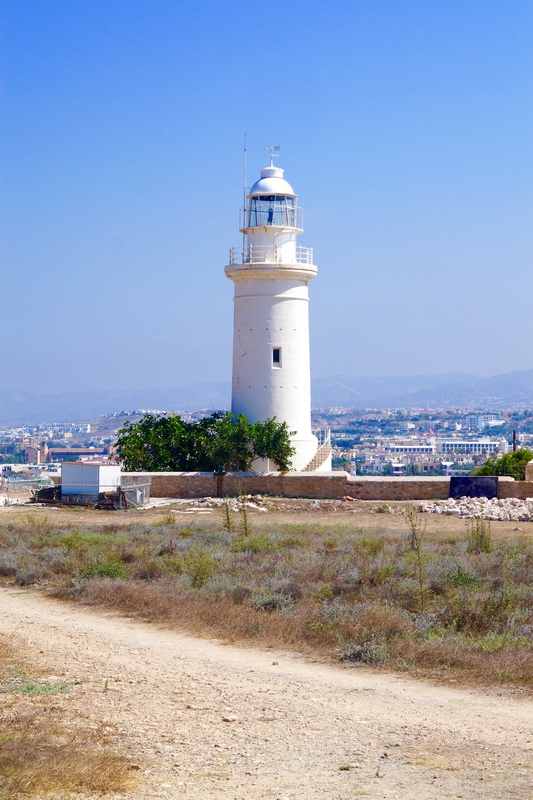 I hope you enjoy looking through my pictures from beautiful Eivissa! I went and did what every foodie loves to do when they’re in a new place, discover and try some of the local food. We rented a villa and as I’m a chef I wanted to use the kitchen at the villa to cook lots of delicious dishes for my family because it’s often cheaper than going out for a meal at a restaurant. I was super happy to get the chance to try ensaïmadas again, I first had these in Mallorca a few years ago and I love them. The pastry is best eaten freshly baked from a panadería (bakery) and dusted generously with icing/powdered sugar. It wouldn’t be a trip to Spain completed without tasting some churros. Churros con chocolate are Spanish doughnuts served with a rich chocolate sauce. The churros are served freshly fried, then they’re sprinkled with sugar and then you can eat them as they are or dunk into a thick hot chocolate dipping sauce. Spaniards eat churros for breakfast along with café con leche (coffee with steamed milk) or Spanish hot chocolate. We got these churros pictured from Cafeteria Royalty in Santa Eulària des Riu, the café promotes the perfect setting to sit back, soak up the sun and watch the world go by. A visit to the Dalt Vila (Ibiza Old Town) on the South East coast of the island. 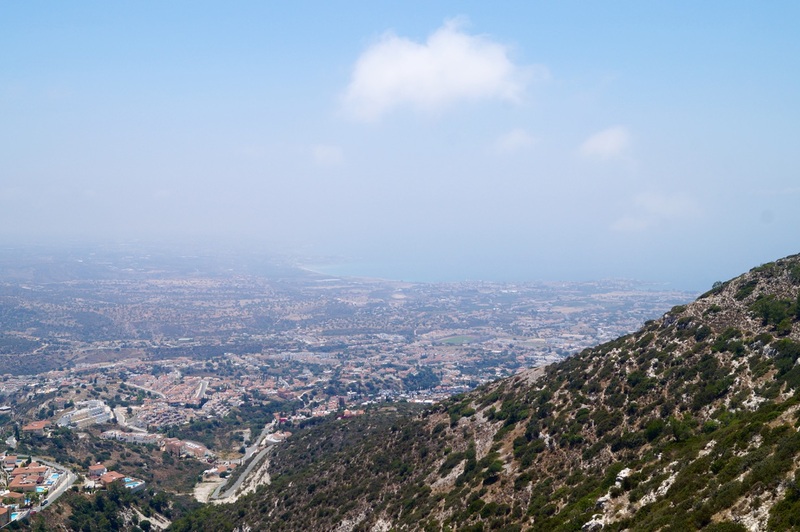 We braved the sweltering 40 degree heat to walk all the way up to the top to see some breathtaking views looking back down on the town and the deep blue sea. 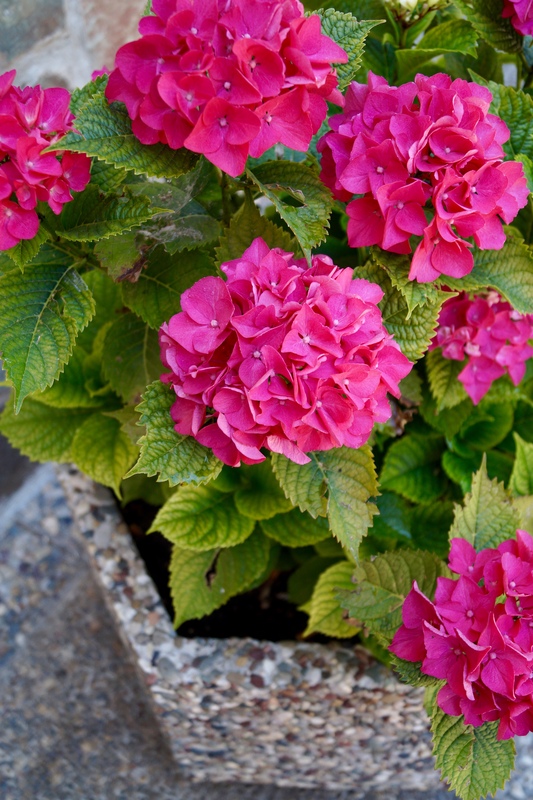 The villa owner, Toni and his wife Pepita have gorgeous flowers and blooms in the garden area of the villa. So perfect for capturing some flower pictures. All images included in this blog post are copyrighted. Please do not use any of the images without prior permission. An easy recipe for patatas bravas. This traditional Spanish tapa consists of crispy cubes of potato with spicy tomato sauce. You will love the simplicity of this dish! For my last recipe of the year, I thought I would share a savoury recipe I make all the time. Patatas bravas always makes an appearance whenever we’re serving tapas for dinner. This recipe would make a fantastic party food for New Years Eve which is in just a couple of days time. My family are massive fans of Spanish food and it’s one of my favourite cuisines to both cook and eat. A few of my most loved Spanish dishes have been inspired by past holidays and trips to Spain. The taste testers really love all kinds of Spanish recipes. Anything from paella, to churros to delicious and easy to make tapas just like the one I’m sharing with you today. If you’ve never made or eaten these, patatas bravas are simply chunks of roasted potato (although traditionally they’re fried) served with a rich and slightly spicy tomato sauce. It’s mandatory (in my opinion) to serve the dish with an aioli dipping sauce which is a basic garlic mayonnaise and the most popular accompaniment to patatas bravas. This recipe has amazing flavour and certainly transforms the humble potato into a delicious and cost effective meal the whole family will enjoy. You will start by preparing a simple spicy tomato sauce, in Spain it’s known as “salsa brava”. This sauce is based on my marinara sauce, but I’ve swapped the Italian herbs for smoked paprika and pinch of both cayenne and chilli to add some authentic Spanish flavour. Once the sauce is simmering away, it’s time to prepare the potatoes for roasting. Peel and cut the potatoes into roughly 1-2 cm chunks – you want the potatoes to be irregular shapes as this helps the sauce “cling” onto the potatoes. Toss the chunks of potato in olive oil and then roast until golden and crispy! I prefer this method to frying because it’s better for you and you don’t need any specialist equipment. To make the sauce: Heat the oil, gently sauté the onion and garlic on a medium heat for 5 minutes until soft. Now add the paprika, cayenne and chilli and continue to cook for a further minute until fragrant. Add the purée along with the chopped tomatoes, the sugar and a splash of water. Season with salt and pepper. Allow the sauce to boil then simmer for 20 minutes, stirring occasionally. To prepare the potatoes: Preheat oven to 200°C / 180 Fan / 400°F / Gas Mark 6. Peel and cut the potatoes into 1-2 cm cubes. Pat the potato cubes with kitchen paper towel to absorb any moisture. Then toss in a bowl with olive oil and salt and pepper. Spread out evenly onto 1-2 large baking trays. Roast for 30-40 minutes or until soft and golden and crisp on the outside. To serve: Scatter the crispy baked potatoes into a tapas bowl/dish. Spoon over the warm sauce. Garnish with chopped parsley, if desired and serve immediately. The tomato sauce can be made in advance. 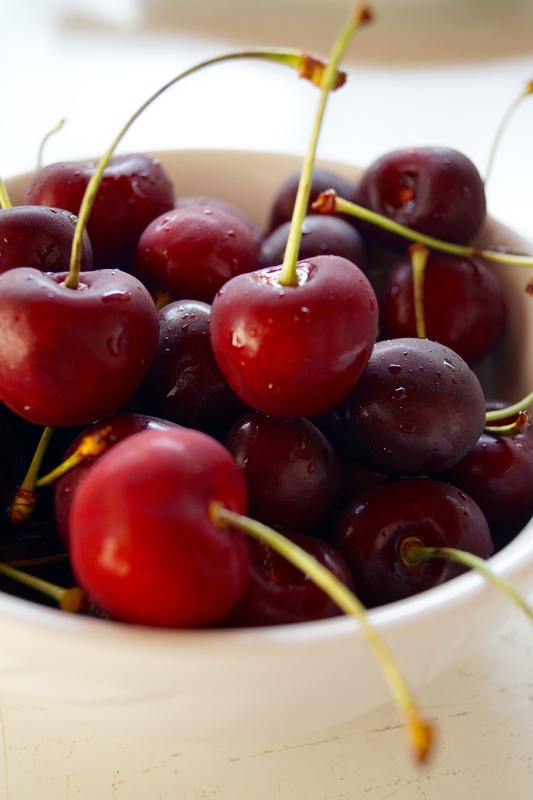 Store in an airtight container and keep in the fridge for up to one week. You can blend the tomato sauce if you prefer a smoother texture. The dish is best served warm, but it’s also delicious cold the next day. Recipe is vegetarian, omit the aioli to make it suitable for vegans. Adjust the level of spice to your taste, add more or less to your preference. This recipe can easily be doubled to cater for more people. I’ve been super busy going through the hundreds of snaps from our holiday and I finally put together a post capturing all our favourite pictures. We visited the stunningly beautiful island of Cyprus for 2 weeks dedicated to relaxation, sightseeing and lots of delicious food. In this article my passion for travel, photography and food combines, so I really hope you enjoy reading and getting a taste for the Cyprus we love. 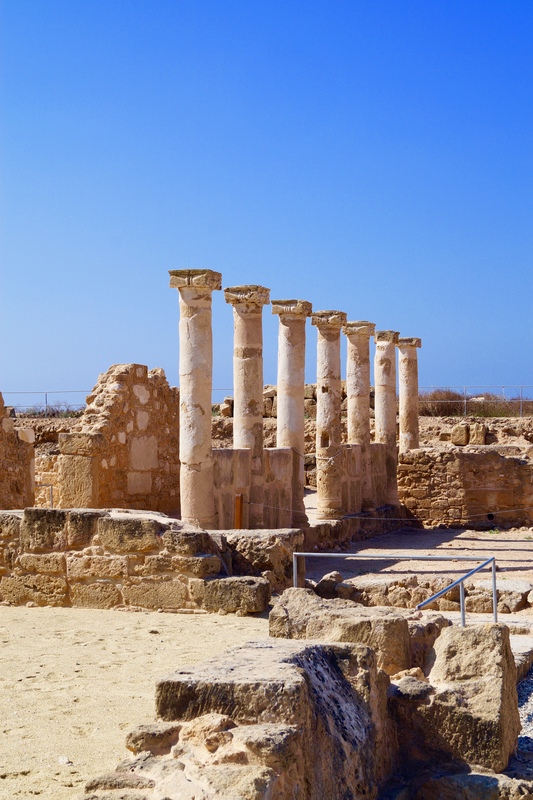 Cyprus is a family favourite holiday destination and before this last visit, we’d visited Cyprus twice before staying on different parts of the island. 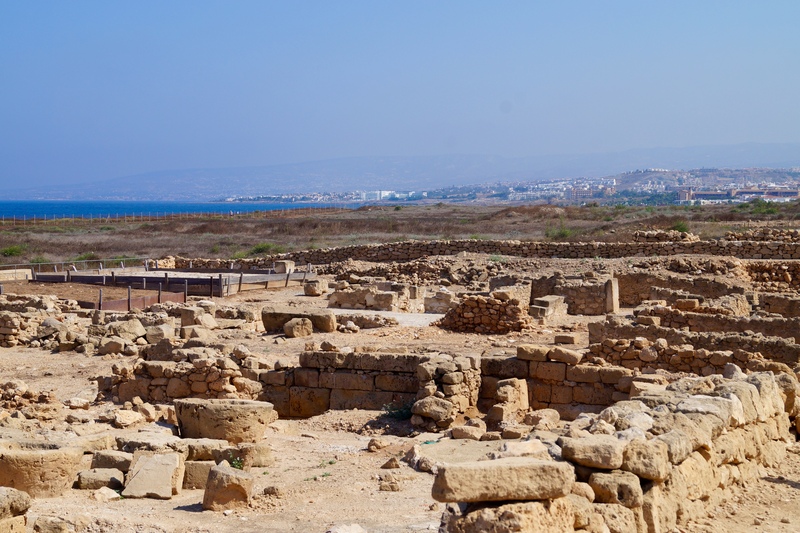 This year we stayed on the western side of the island in the Paphos district. As with all the holidays we go on we love to get away from the tourist trails and appreciate the hidden gems. Our villa was located in beautiful Argaka – a small village with stunning shorelines, beachside restaurants and local bakeries. The area where we were staying was within a short car journey from the lovely town of Polis, where we would drive most nights to get an ice cream to cool down in the evening heat – it’s actually a common thing for most Cypriots to head out for an evening ice cream or cake after dinner. I’ll pretty much take any excuse to eat ice cream or cake! 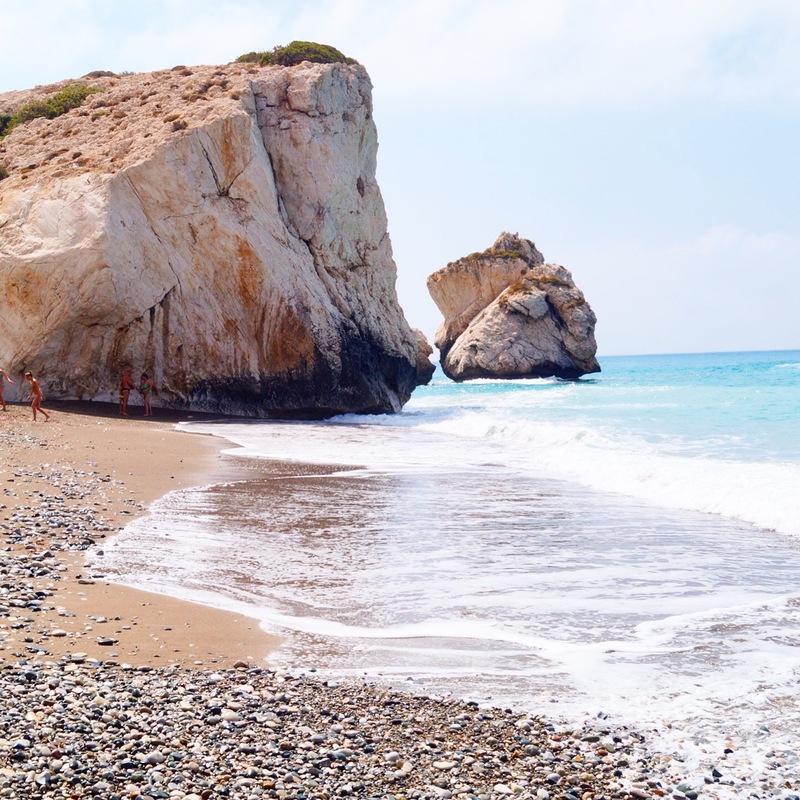 Aphrodite’s Rock – also known as “Petra tou Romiou”. 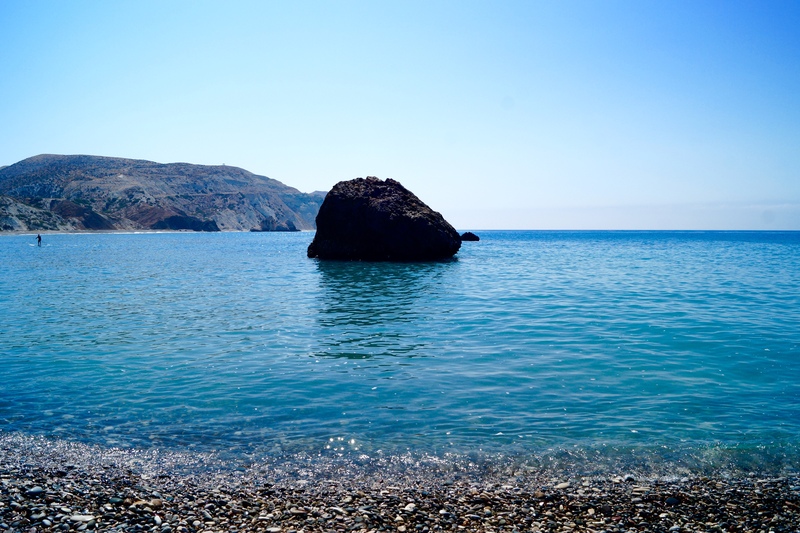 According to Greek mythology and local legends, this is the exact spot where Aphrodite – the Greek ggoddess of love and beauty rose from the waves and sea. The area is beautiful, with glistening water and stunning rocky views. I remembered from our last visit to Cyprus at Agio Georgios there were food and pottery stalls located just outside by the church. And as you can imagine, being a food blogger and loving collecting new bowls, plates and props it was great fun to look around and buy my favourite pieces from the stall. I love the hand painted pottery, it has a homely touch, looks very special and will make a beautiful addition to my kitchen. Cypriots absolutely adore their fresh fruit. In the supermarkets there is so many different, healthy fresh fruits to chose from. Watermelon is a particular favourite of ours. The funny thing is as we were driving through some of the towns they have trucks crammed full of watermelons and it’s not uncommon to see the odd melon or two fall off and crack open when it hits the road! A number of years ago when we visited Zakynthos we dined at an amazing family run restaurant, Gallini’s. It was a family run business and the owners and staff were extremely welcoming and we became good friends. I remember every meal ended with a large platter of watermelon to refresh our palate after an evening of authentic Greek food. 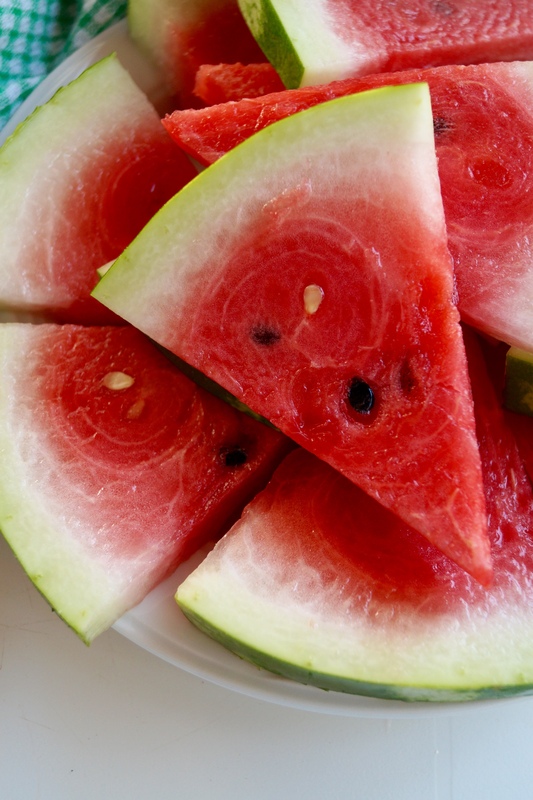 I didn’t realise until this visit to Cyprus that a traditional Cypriot summer snack is watermelon and halloumi cheese – sounds like a great combo, with the mix of sweetness and the salty cheese. Halloumi is a Cypriot speciality food and the best way to serve it is fried and then drizzled with fresh lemon and tzatziki! We enjoyed many local specialities everyday and I even had the chance to try some new foods like kattimeri (a Cypriot pancake/crepe) and tasted some old favourites like the local village bread – in Greece and Cyrpus they serve this style bread before a meal. As appealing as the local restaurants are serving delicious food, they tend to be very expensive, and every year we self cater and stay at our own villa so most nights we became quite creative with the food we cooked. I made quite a few savoury recipes from the W.J.B.N kitchen including this spaghetti with courgettes, Greek-style orzo pasta salad and this linguine gamberi with the fresh local seafood. This dish is one of mum actually created. Sypros (the lovely villa owner) had many trees around the property with all homegrown and organic produce (avocado and mango trees) – I wish I could grow mangoes and avocados at home. He came round one day with homegrown tomatoes and apples, he had previously promised to bring round some avocados but I don’t think they were ripened enough. I’d already planned my mornings brekkie of avocado toast with chilli and lemon. However, both the apples and tomatoes were deliciously sweet and I love the fact they were homegrown too because organic produce always tastes better. 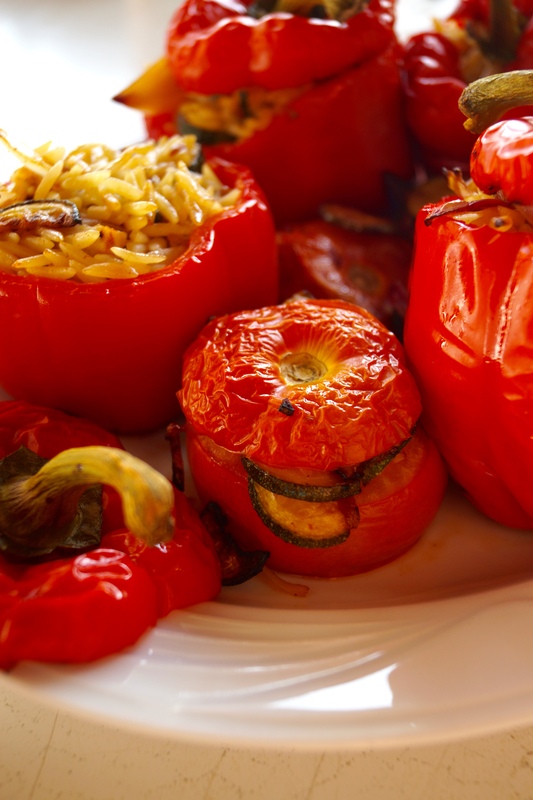 The tomatoes were amazing stuffed with veggies and orzo for dinner – that is a very Greek dish! 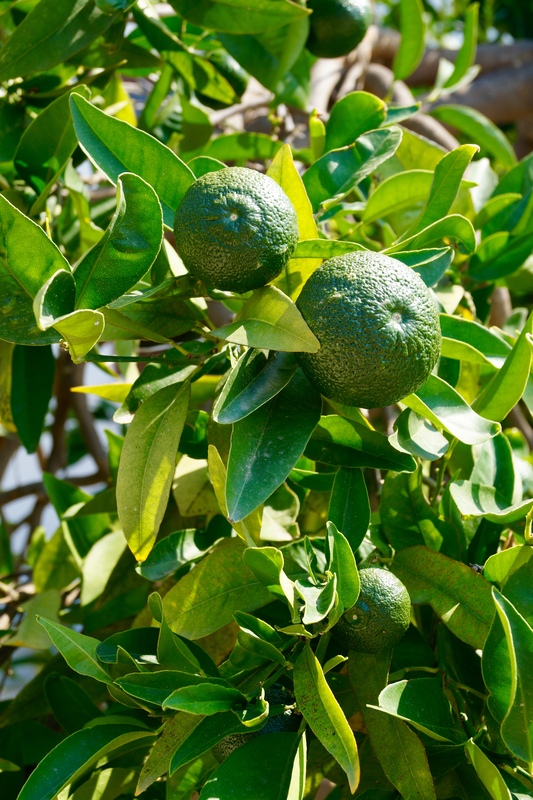 Mandarins are grown all over the island – you see them everywhere! At first we thought these were limes! Greek salad – the perfect summer lunch served with pita bread. We ate Greek salad every day and enjoy it all the time at home. 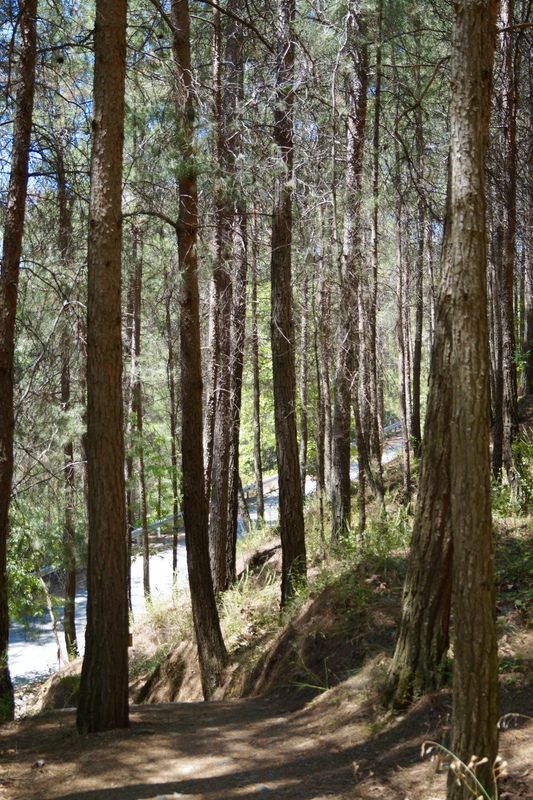 It’s amazing up in the Troodos Mountains. There is not a soul in sight, we drove up through the winding roads on our way to the Kykkos Monastery and on the way stopped off at the Mouffalon Enclosure. It’s free entry and if you’re lucky enough like we were you may get the chance to see the moufflon and their babies. It wouldn’t be a summer holiday without ice cream and fro-yo! We enjoyed or fair share whilst away in Cyprus! 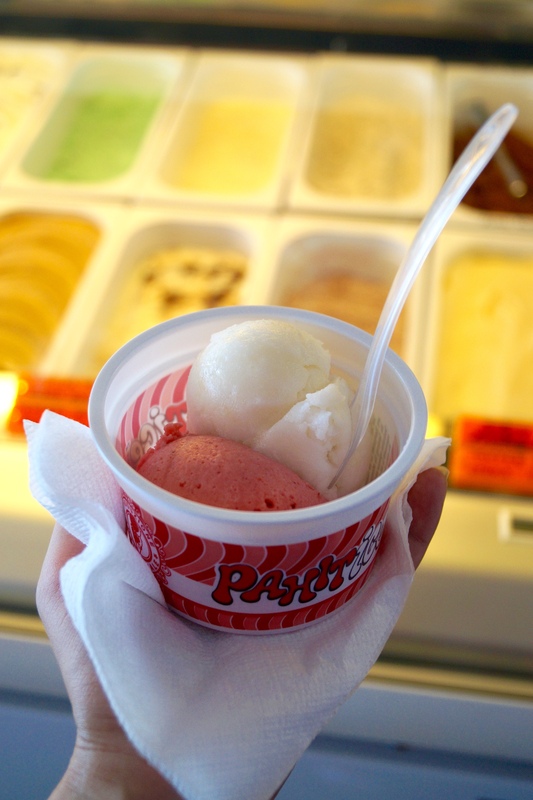 The sorbets are amazing – my favourites were strawberry and lemon! Mum modelling some gorgeous cherry frozen yogurt! 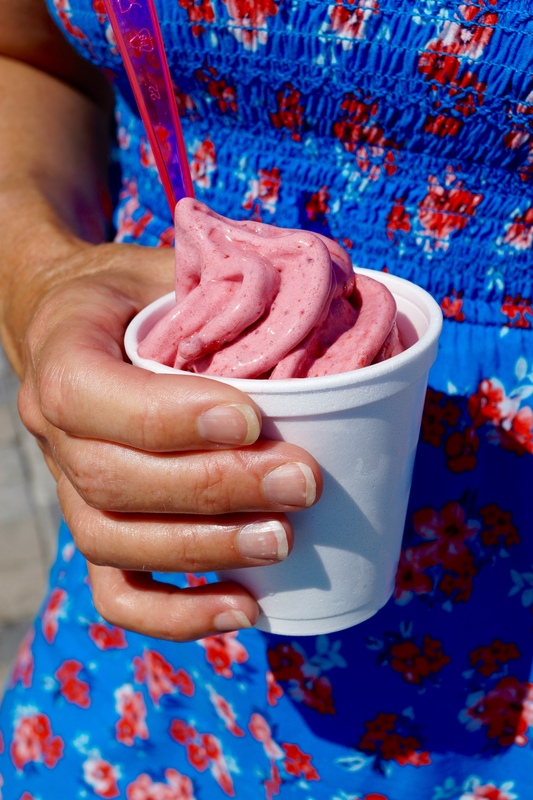 Greek frozen yogurt is a must try! Easy Homemade Lemonade. 3-ingredients and unbelievably simple and quick to make. It’s refreshing, tangy and the perfect quench-thirsting drink to sip on a warm summer day. As you read this blog post, I’m currently relaxing in the beautiful Mediterranean in sunny paradise. It’s a much needed break, after a long year of studies and working on my blog. It’s nice to have 2 weeks dedicated to total relaxation. When I’m back I have lots more recipes lined up for the blog and I’ll definitely be sharing pictures from our trip. So back to today’s recipe. For me there is nothing quite like a glass of ice cold lemonade on a boiling hot day. It’s one of my favourite summer drinks and I knew this year I needed to share a basic recipe on how to make your own homemade lemonade. 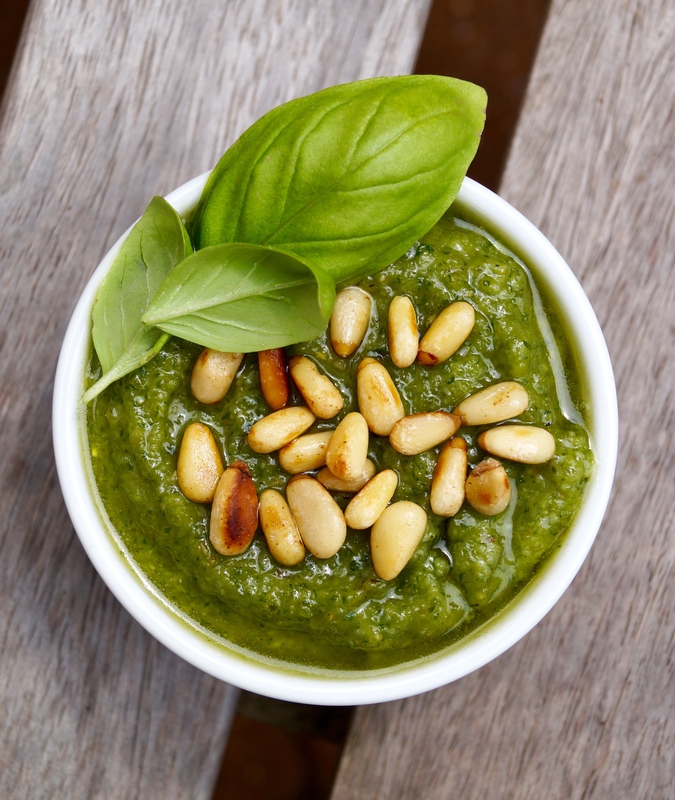 You will have this fab and easy recipe on hand ready for those hot summer days. 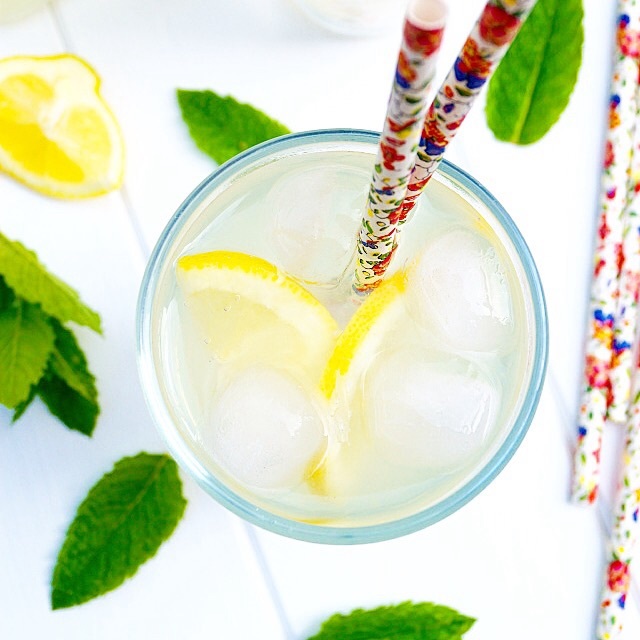 Luckily the English summer has been fantastic so far with soaring temperatures and long sunny days and evenings so I’ve had the chance to enjoy this delicious lemonade many times! My recipe couldn’t be any easier to make! I mean it’s not really even a recipe because it’s so incredibly easy and quick to prepare! You won’t believe that all you have to do is stir together just 3 ingredients, chill and it’s ready to drink! Most lemonade recipes on the web are over complicated and require standing over hot stove and making sugar syrup. When it’s a gazillion degrees outside I don’t know about you but the last place I want to be is in a hot kitchen stirring something over the stove. It’s really important to stir the lemonade well before chilling as you really need to dissolve all the sugar otherwise it will have a gritty texture. 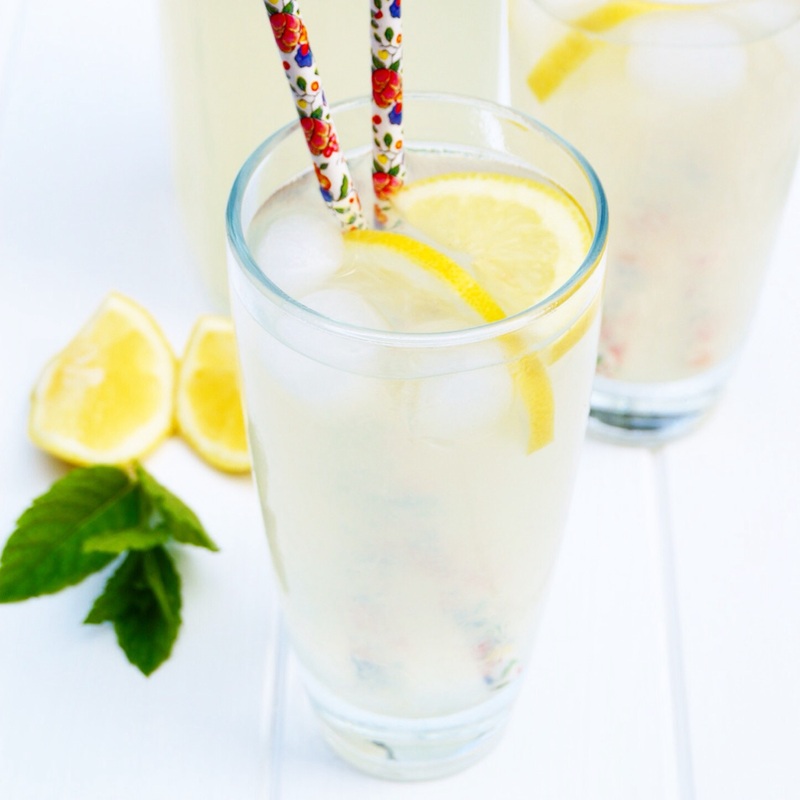 Plus it’s such a good feeling when you have make homemade lemonade – it’s 100% fresh and free from all those added flavourings, additives and colourings. This lemonade is still but if preferred you can swap the cold water for sparkling water. Making a drink recipe for the blog gave me the perfect opportunity to use these beautiful floral straws sent to me by my lovely friend Jemma at Iced Jems. In a large pitcher (2 litres) combine the lemon juice, water and sugar. Simply stir until all the sugar has dissolved. Chill the lemonade in the refrigerator. When ready to serve, pour into a glass and garnish with ice cubes and lemon wedges.